London Days: Uniko Studio Release Day! Today is a very happy Monday as it is the Release Day at Uniko Studio. You have had all the sneak peeks and intro days and today you have chance to see more examples of how to use the sets, a blog hop with chance to win the whole release sets. Plus you can actually go right over to the store here and start purchasing these amazing stamps. And, TODAY ONLY, if you spend over £25 or more you will get free world wide shipping! The details of the blog hop you can find on the main Uniko Studio Blog. But basically you need to leave a comment on my blog, all the blogs of the Design Team and the Uniko Blog. Do this and you could win the entire release....that is four sets of the most stunning stamps!! It is my last day as the Guest Designer for Uniko Studio and I have a couple more cards to share with you using the release stamps. This time I stamped the base of the flower in the pops of colours from the Fusion photo directly onto the card base. I then used the second part of the flower stamp embossing it on vellum with white embossing powder. I tried to curl the edges of the vellum so you would see more of these Summer colours. I popped these up on foam pads to give dimension. I looked at the card for a bit but decided something was missing and three little black gems sorted this for me. The linen impression plate gave the card more texture. This Flower Power set is full of possibilities and well worth popping into your shopping basket! I will enter this into Fusion-see photo and sketch below and the Mixed Media Card Challenge with a Summer these-mine being flowers and colours. I have again used white embossing but this time on this cute little baby suit. I think this is the first time I have embossed on to patterned paper but I thought it would give the soft look I wanted for a baby card. I used vellum again but this time stamped the sentiment directly onto the vellum. As I had no more of this patterned paper I decided to add my own outline of white dots onto the blue card using a white pen. I got the layout for this card from this week's sketch at STAMPlorations-see below. I have had such a fun week being GDT for Uniko Studio and thank Bev for giving this honour. I hope I have inspired you along the way and have got you to do some shopping!! Now it is time for you to go staright over to the main Uniko Studio Blog and start hopping! Fabulous cards, I love everything about them but especially the colours you've used, beautiful. Two beautiful cards Sandie and so delicate. I've enjoyed being on the GDT with you for this release and excited to look at what's been posted by you each day. Oh these are all so gorgeous Sandie. 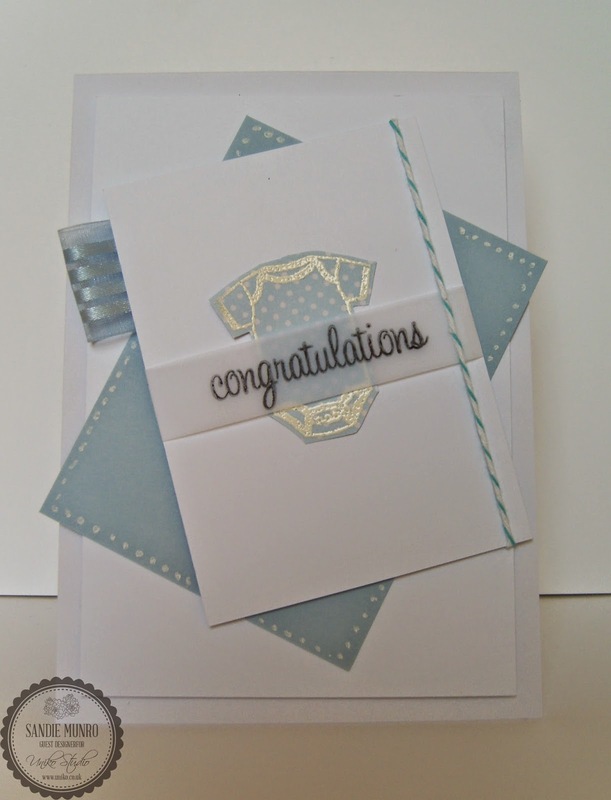 Especially love the Fusion card...the soft texture is gorgeous...and the sweet little baby card. Love the embossing. Beautiful cards. Love the way you used the flower power set. Sandie, two more eye-catching cards to showcase not only these sweet new stamps, but your ability to work magic with them! Your flower card is ever so delicate and pretty; the baby card, darling!! You've been an outstanding GD over at Uniko!! Both lovely cards! Embossing on patterned paper is such a good idea, can't remember the last time I did it, so effective! Super cute cards - love the crisp, clean look. Super cute cards! Love them. Love the way you made the flowers dimensional, and that sweet baby card! Delightful new stamps! I've just looked through all your DT cards over the week and they are all stunning. The baby card is my favourite, really sweet! I've loved your cards this week. 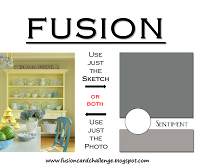 You've done a fabulous job as a guest designer! Great cards. Love the great CAS design of the flower power card. Seeing all your cards using these fab new sets inspired me to check out all the other designers cards as well, and the more I see the more I love them. They're so versatile! I like how you used the flowers, they look so different popped up like this than stamped onto a fiat background, and that baby card is just adorable! Great use of DP and vellum! I love the layered embossed flowers over colorful papers and ur second card is so adorable :) thank u for sharing with MMCC, Fusion and Stamplorations ! Sandie, so lovely, and the adorbale Baby card, also is PERFECT for Paper Crafting Challenges, you have a chance to win a Neat & Tangled set if you link up!!!! ---love to see you there too!!!!! Thanks for joining us at FUSION!!!! Great cards, especially like the baby one. Simple and lovely Sandie! Thanks for sharing it with us at the Runway Inspired Challenge! Such sweet cards, Sandie. I love the color peeking out from behind the vellum blooms. Thanks for joining us at MMCC #2. Love those beautiful popped up flowers! Thanks for strutting your stuff with us at Runway Inspired Challenge! Your blooms are so pretty with the layer of embossed vellum on top! Thanks for playing with both the Fusion and Mixed Media Card challenges! Super cute cards! So glad you joined in the fun @ FUSION and the Mixed Media Card Challenge!